UPDATED: Baltimore County Public Schools recently touted yet another education technology award for three top administrators who have pushed the controversial laptop program known as STAT — locally and at conferences nationwide. CoSN “sponsors,” according to their website, include tech firms doing business with BCPS: Schoology, CDW-G, HP, SAFARI Montage, Microsoft, Cisco, and others that are paid nearly $2 million annually in license fees alone, with increases slated for next year’s controversial proposed BCPS budget. 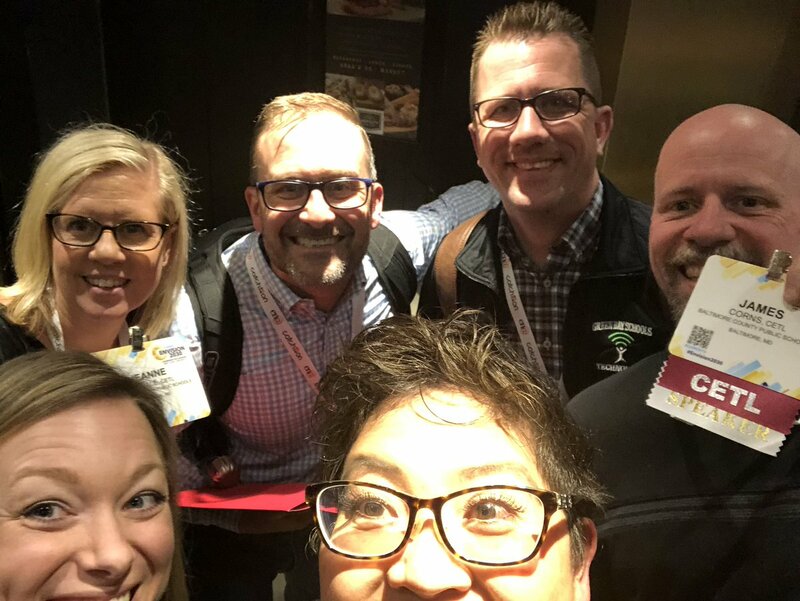 Check out this tweeted image too of BCPS IT “leaders” yucking it up last week at the CoSN Conference in Portland, Oregon. Who is paying for all this? (See postscript below, with a whopping $1.75 million in employee travel and conference-related costs proposed for next budget year alone). * Valuable marketing opportunities by providing access to education technology leaders virtually and at face-to-face meetings. * Increased visibility in the K-12 education market. * Stronger understanding of the education marketplace and trends impacting companies. Is there a specific corporate sponsor for the CETL certifications of the three taxpayer-paid BCPS employees? How can conflicted cross-germination connections possibly continue? The controversial Education Research & Development Institute (ERDI) brokers similar private company access to public school decision makers, as reported by The New York Times. That included ERDI conferences, panels, and face-to-face meetings with Dance, who was later convicted of perjury related to financial disclosure forms. Current Interim Superintendent Verletta White was later cited for ethics violations for undisclosed income from ERDI. Among other criticized contracts in various districts across the country, ERDI clients have been awarded more than $60 million in no-bid BCPS contract spending authorities. According to ERDI offerings: “Panels of expert superintendents provide honest, candid insight and feedback that clients typically incorporate to upgrade their products and services and to modify their marketing plans . . . In addition to the panel session, ERDI conferences include different social events to help clients truly harness the power of networking with these top educational leaders.” For more info, see ERDI About Us. Ongoing questionable relationships between public school admins and industry groups paid by for-profit entities to gain access to such leaders raise questions about whether anyone has learned anything about ethics, potential conflicts-of-interest, spending priorities, or biased approaches to educating children in Baltimore County Public Schools. Bottom line: Taxpayer-funded junkets to promote an overpriced, underperforming edtech program in public schools — after hundreds of millions of dollars wasted — in the midst of a severe county budget crisis? Baltimore County — facing an $81 million shortfall and a litany of desperate needs in public schools — must act. It’s time for a much closer look at BCPS employee travel, spending, and the appearance of conflicts-of-interest: Local media, state and county auditors, Board of Education, Baltimore County elected officials? More on CoSN’s deep-pocket tech connections here from Missouri Education Watchdog, links and resources within. For more on BCPS employee travel costs: FYI: See “Responses to board member questions,” # 20: ‘Over-night travel per diem, Conference registration fees, Professional dues’ — for exactly which departments and employee positions? Note that this amount does not even include mileage, for mostly local travel and events. See earlier budget analysis on costly administrator travel expenditures here and here. Other slated panels and edtech conferences, search for employee names, including Ryan Imbriale, FETC 2020 here and at the International Society for Technology in Education (ISTE) here. See Imbriale’s testimonial ad for ISTE “Membership” here too, promotions Dance also did, to much criticism. “I really believe that ISTE is serving all educators all around the world when it comes to finding a place for digital learning,” Ryan Imbriale. Ongoing meetings will lead to County-presented budget by April 15, including possible changes to STAT funding . . . stay tuned. The Baltimore County Public Schools budget is facing a money crunch and growing controversy after the county executive warned of an $81 million shortfall in the county budget next year. Yet this crisis has been a long time coming for the 25th largest school district in the nation, which nonetheless has been requesting an 11.5 percent increase — or a whopping $91 million more — in taxpayer dollars. He’s right. Yet how did this all happen? In large part, the culprit is wanton spending on the laptop-per-student program known as STAT, which a review of records indicates was never financially sustainable long-term. When the program was launched in 2014 by now-disgraced Superintendent Dallas Dance, promises of a “21st Century” transformation in learning were made here in Baltimore County and across the country. Five years and hundreds of millions of taxpayer dollars later, the program has expanded despite poor student test results and other flagging outcomes. After much debate (see postscripts), the board recently approved a controversial revised proposed budget to send to the county that still includes massive funding for STAT. How exactly did we get here? Various analyses since 2016 by the Baltimore County Office of the Auditor — as well as BCPS budgets, and other school system records — indicate that the early years of the STAT rollout were partly propped up because the budget was apparently padded with unused funds built up over a few years, since Dance first arrived in July 2012, though he said little to nothing about a digital conversion at that time. That included insufficiently funding textbooks, transportation support, and special education departments for starters, records show. Such “under appropriation” was criticized by county auditors. One concern then: Why would BCPS keep coming back to the county to ask for tens of millions more than it was actually spending? Numerous BCPS redirects from “all areas of operation,” and tens of millions in emergency funds were also siphoned off as recently as last year to pay for the experimental, edtech industry-oriented initiative, records show. (In the 2018-19 budget, for example, BCPS relied on “the use of an unprecedented level” of the district’s emergency or “fund balance as a revenue source” for STAT and other costs. “Such a fund balance, by the school system’s own projections, will not be available at a similar magnitude in future years,” a May 2018 county auditors’ report noted. Now, among other issues, the padding and raiding have apparently run their courses and a possible “fake feasibility” seems evident. The school administration under Dance and Interim Superintendent Verletta White — also a digital education supporter affiliated with numerous outside ed-tech industry groups and consulting firms (see links below) — expected Baltimore County to greatly expand and commit its support of the laptop program right about now, according to STAT planning documents, administration statements, and the BCPS Digital Conversion/STAT budget. (See Towson Flyer op-ed on STAT costs, with link to the actual conversion budget within, details in postscript 1 below). The bottom line seems to be: The BCPS administration has spent beyond its means, gambling that the county would pick up a higher tab for the digital initiative once the money started running out — and opportunity costs became clearly unsustainable for teachers, students, and a public school district with so many dire needs — sparking recent protests. As far back as 2016 (summary and link to report here), county auditors noted that spending on STAT had risen, “while funding for instructional [salaries] has remained relatively flat, and funding for the Instructional Textbooks & Supplies program has declined.” Such materials and supplies have been “pinched,” the report noted. For example, a chart under Mid-Level Administration “professional services” revealed that an average $900,000 was requested by BCPS in fiscal years 2013, 2014 and 2015—yet no money was spent in that category. Similar amounts were nonetheless requested by district administrators year to year. Meanwhile, annual requests for “operational supplies” related to textbooks topped $14 million annually in those years. Yet the actual amounts spent only averaged $700,000. In FY 2015, only 3.5 percent was spent in that category, with nearly $13 million left over, the auditors’ analysis revealed. Money not spent meant services not rendered. A similar “under appropriation” showed up in Special Education programs, where BCPS requested a very specific $367,404 in FY 2015 for student transportation “professional services.” Yet only $15,000 was spent. That “consistent” pattern, as noted by auditors, applied to previous years as well. Today, that money has apparently been long spent out, and there’s nowhere else to squeeze, especially as constituents ask for funding for many other needs, some previously slashed, including: counselors, per-pupil student workers, transportation funds, special education needs, breakfasts for needy students, school discretionary expenses, support for a growing population of English-as-a-second-language students, promised teacher raises, staffing levels, security personnel and measures, and on and on. These are true needs, with only so much money in the pot. Is that what the digital conversion playbook counted on to pressure expanded funding? The larger question: Should county taxes be increased to shore up the troubled and costly laptop and digital curricula program? If any tax rates are raised, that funding should go to building new schools to replace long-dilapidated Lansdowne, Towson, and Dulaney High Schools, among others. Over time, some members of the Board of Education past and present have questioned the spending on STAT and pressed for scaling back the rollout or otherwise pulling back the ratios of laptops per students in the elementary grades, among other revisions to address rising costs. (Laptops are now to be two-per-student in grades 1 and 2 starting next year, though White had also alarmingly pressed for more devices in kindergarten–at an apparent price tag of more than $4 million. See Postscript 2). Previous school board member Michael Collins made a prescient statement in a January 2016 board meeting: “I believe very strongly in technology in schools, but we don’t know how this is all working out. At all. And the info we are getting from the data so far is not good. We are just going awfully fast, and we are going to be spending a couple of billion dollars — that’s with a B — at least on this program.” See other details regarding costs here. Transparency and fiscal responsibility is indeed needed. This summary is merely a glimpse and the specifics might change. That’s why county auditor reports, past and current schools’ budgets, a pending outside audit, and other fiscal documents must be fully reviewed by the county and state (and outside media), since taxpayers would continually be on the line for such “forever costs.” The county auditors’ analyses of BCPS budgets, for example, revealed similar problems and concerns when released in May 2017 and in 2018, when questions regarding underfunded retiree health benefits and a pending fiscal crisis were first raised publicly. An Office of the Auditor analysis of the FY2020 schools’ budget is expected to be prepared for the county council and administration this upcoming May. Be on the lookout. Technology options are needed in schools, but not at the price of irresponsible misspending of public dollars and possible malfeasance. One increasingly relevant concern: Interim Superintendent Verletta White, a highly experienced educator and leader, has nonetheless fostered ongoing affiliations with digital education industry groups, a “professional consultancy firm,” as well as digital curricula and related efforts despite past controversies over outside consulting. Dance had a similar litany of controversial edtech ties. In the end, one needs to wonder whether such loyalties reside more with these edtech groups and ideals than they should. Where is objectivity on the costly STAT laptop-per-student and digital curricula program when, according to White’s CV (see link here), the bulk of the interim superintendent’s outside affiliations have been with such edtech proponents? AFFILIATIONS: Center for Digital Education Advisory Committee; Digital Education Chief Academic Officer Advisory Council; Education Research and Development Advisory Council (ERDI?, which advises companies doing business with BCPS and was related to White’s ethics violations. The interim superintendent has also alarmingly failed to publicly disclose which companies she consulted with on ERDI panels and related.) There’s also her stated affiliation with the International Society for Technology in Education (ISTE). After an ethics violation finding last year, White said she “made an honest mistake,” and that she was under the impression that she was “‘only to list companies [on disclosure forms] with whom the school system had a contract or a pending contract.’ She has amended her financial disclosure reports to the school system and says she will not accept outside work in the future,” according to a 2018 article in the Sun. Are any of these outside “affiliations” paid roles? Does White receive any in-kind gifts, meals, items, or covered hotel or travel costs? Do these entities also represent or are sponsored by any BCPS vendors or others doing business with the Board of Education and/or BCPS? And, is White then using her “prestige of office” for private gain, which was cited in her previous ethics violation? This all raises questions of possible conflicts of interest regarding the continuing high-dollar digital initiative at BCPS. Under good governing standards, the appearance of a conflict of interest should be avoided, see also the district’s Code of Ethics. If one wonders how that might play out, consider BCPS’ Passport/Spanish language program, which White recently defended against any budget cuts by the board, despite high costs (more than $7 million and counting) and troubled results and controversy. White touts an award from Fuel Education on her CV; Yet Fuel Education sells the digital platform, MIL, or Middlebury Interactive Languages. MIL/Middlebury has long been an ERDI client. The company has a $7.5 million contract spending authority with BCPS). Updated 2/26, with further updates to come. Partly in response to this op-ed, Board of Education Vice Chair Julie C. Henn posted this note on her Facebook page: “My [recent] motion to reign in spending for 1:1 devices failed by one vote. The fight to do what’s right for our students and teachers, and to spend wisely, continues. My amended motion to keep the Kindergarten device/student ratio at 5:1 passed unanimously. In response to Henn’s explanation, school board member Lily Rowe also on Facebook wrote that she supported more phased adjustments to the laptop and digital curricula though did not specify changes: “Moving to end K-8 device leases effective July 2019 would create chaos as we would have no way to implement the current curriculum for grades 3-8. I think we can all agree that if building a plane while flying it was a bad idea then dismantling it in the air is a worse one.” That’s a good point. But unfortunately, edtech proponents counted on such difficulties when they instituted what they called “second order” or irreversible change. See this explanation and linked story. 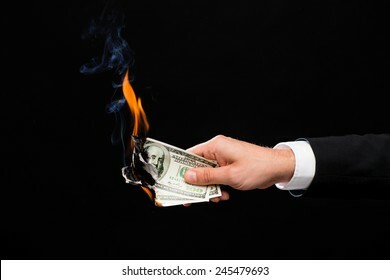 As former superintendent Dance once claimed: “When you do a ‘second order change,’ we can’t go back to business as usual.” That, however, does not take into account humans’ adaptability in the face of crises, especially when children’s education, health, safety, and numerous varied needs are at stake. The Baltimore County Board of Education will vote on the BCPS FY2020 Operating Budget on Tuesday, February 19. The proposed budget is 11% over Maintenance of Effort. TABCO and other bargaining units have testified for BCPS and the BOE to “go big” and ask for this amount so teachers can receive raises and cost-of-living adjustments, greatly needed support staff can be hired, and the extremely expensive STAT initiative can continue to be funded. Others have asked the BOE to do its due diligence and present a realistic budget outlining its priorities vs. letting the County government decide. Read this February 14 Baltimore Sun article about the fiscal realities. Read this November 2018 essay, which explains how we got here. Read this February 1 BCPS teacher’s Letter to the Editor about the tough choices required. The vast amount of wasteful spending on the laptop-per-student program known as STAT has created a long-looming fiscal crisis in Baltimore County Public Schools and the county. A recent 2019-20 budget proposal revision that would slash promised teacher pay increases — sparking protest — is the latest indicator of how dire the situation has become. Teachers are education’s greatest assets and many classroom needs — smaller class sizes, etc — have been sideswiped since this troubled program began with much fanfare in fall 2014. For the newly elected school board members and county executive, who are increasingly aware of this scenario, here are a few articles pulled together during more than two years of following this issue in Baltimore County, MD. See various in-depth resources, data, citations, and records relevant to this crisis. What’s transpired at BCPS’ still-touted yet mostly failed digital initiative raises red flags for local and national school districts implementing or considering laptop-per-student programs. * BCPS is overpaying for laptops (more than twice the industry and regional average, see link below) — under two contracts with the same HP-reseller, Daly Computers, for nearly $300 million. BCPS also has been overfunding poorly designed software such as iReady and DreamBox — brought to the district under questionable ethical circumstances via the previous and current administration’s ties with controversial edtech broker ERDI. Such software or platform contracts are costing the district and taxpayers additional tens of millions of dollars. 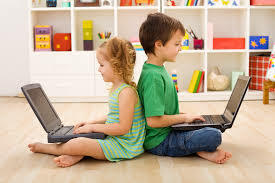 * Laptops assigned one-per-student is considered developmentally inappropriate in younger grades K-2 even in digital education programs across the nation, and in many elementary schools in general. Increased screen time is a concern for children’s brain development (see groundbreaking NIH study and citation below), yet BCPS has ignored emerging science to irresponsibly insist on hours at school and home for children as young as six. * BCPS’ lack of results, declining test scores, and innumerable problems with wifi connectivity — as well as counterproductive frustration among students being poorly “taught” via software that doesn’t work, and rampant student off-task gaming and internet surfing — reveal this overall program to be a clear fiasco. Please direct Interim BCPS Superintendent White to further cut this program in elementary schools: eliminating devices in grades 1 and 2 or possibly moving to a more amenable 3:1 ratio or providing devices on carts to various classrooms during a transition. These options alone would save tens of millions of dollars. Other changes (also pulling unnecessary devices out of kindergarten ‘stations’) and a close fiscal review of tech use and various contracts is needed. In the end, an overhaul of the technology program is required — and fresh leadership is needed with a new superintendent who can approach the use of tech in schools with an objective eye to developmental appropriateness and longterm fiscal responsibility. * Laptop program brings no results (note this is a $300 million program in laptop costs alone with the second contract round approved, over just the first several years of the ongoing “instructional program.”). The proposed BCPS FY20 operating budget was presented at the 1/8/19 Board of Education meeting. Devices will be used at a 2:1 ratio (2 students/1 device) in Grades K to 2; Grade 3 and up will use them at a 1:1 ratio. Younger children will use much less expensive Chromebooks. Read 1/8/19 Sun article here.